The Gaia hypothesis says that the planet interacts with life itself, to keep the planet fit for life. Albedo is how well something reflects light. Albedo 1 (or 100%) is a perfect reflector. Albedo 0 is a perfect absorber. Perfect white has albedo 100%, and perfect black 0%. Luminosity is the amount of light striking a unit area. DaisyWorld was invented by James Lovelock and Andrew Watson, to explain how the Gaia Hypothesis did not require a sentient Earth, but only feedback loops. Life itself could maintain the planet fit for life - within limits. Which is a cool result. But it means little without a simulator. Click here to run the simulator. Like all environmental models, DaisyWorld is a cartoon of the world. In this cartoon, there are daisies, and barren land. The sun shines on the world, and some light turns into heat, and some is reflected back off into space. 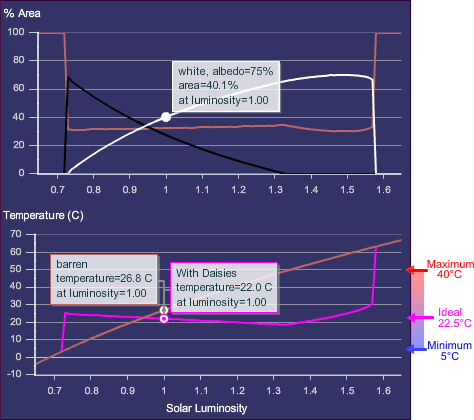 How much light is absorbed - so how warm the planet is - depends on the color of the planet. Daisies need certain temperatures to live. And they come in a variety of colors. Basic DaisyWorld has white and black. White reflects most light, and black absorbs it. Barren land falls in between. This ability of a color to reflect light is called albedo. Black daisies make a neighborhood warmer than barren ground. White daisies make it cooler. Sunlight reflects off different color daisies. Black daisies absorb most light, turning it into heat. White daisies reflect most light, and stay cooler. The ghost of a daisy represents a barren spot. DaisyWorld's daisies aren't perfect. The white daisies' albedo is 75%, black 25%, and barren ground 50%. Like all life, daisies die. At any time, at least 30% of the land is barren as daisies die, giving up their space that more daisies - of whatever color - may be born. The minimum temperature for daisies is 5°C. The maximum is 40°C. Above or below those temperatures, the daisy birthrate is zero, and the whole planet is barren. The daisy birthrate is highest at their ideal temperature of 22.5°C. In Fahrenheit, that's 41°F to 104°F livable, with an ideal of 73°F. By the mix of white and black daisies and barren ground, DaisyWorld strives to keep its temperatures in the range that allows daisies to live. When the world is too cool for black daisies to warm it, or too hot for white daisies to cool it, the planet is barren. Over billions of years, the sun changes, and grows brighter. We call this solar input luminosity. The luminosity of "now" is assigned a value of 1.0. DaisyWorld runs over time - theoretically billions of years - showing how the mix of daisies changes as luminosity grows. At first, the weak incoming light can't warm the planet enough for daisies. Then black daisies begin to survive, and the planet warms. In fact, it warms to the ideal temperature for daisies to thrive. And with nothing but mix of daisies, it manages to keep temperatures close to ideal over a very wide range of luminosity. DaisyWorld with black and white daisies. Notice how the daisies control the planet temperature close to the daisy ideal temperature (pink line, bottom plot). The planet even cools as luminosity increases. Without daisies, the planet's temperature simply rises with luminosity (brown line, bottom plot). 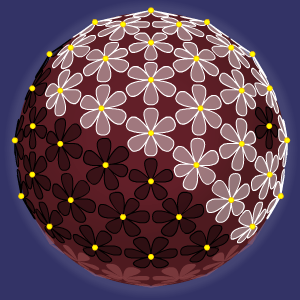 The DaisyBall simulator gives a choice of logic - classic DaisyWorld, and my own custom variant DaisyBall. In DaisyWorld, there is no sense of location to the world. The "neighborhood" of a daisy is simply other daisies of the same color. Though the daisies are drawn on a ball in both cases, the DaisyWorld display is simply drawing percent of daisies by percent of population. drawn at the bottom of the ball, plus 25% black daisies and 42% white daisies. There's no spatial meaning to which daisy is painted which color. You can roll the ball with the mouse. 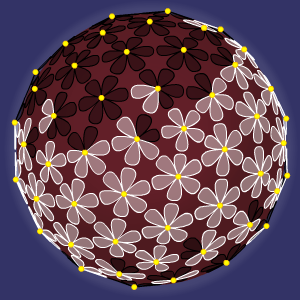 In my DaisyBall variant, each daisy position has latitude-longitude location. The whole DaisyWorld game plays out at each location, and each drawn daisy represents a whole multicolor daisy population at that location. Like Earth, the world is tilted. The poles get much weaker light than the tropics. 35% each black and white. Barren isn't drawn unless there are no living daisies. temperate zone has a mix of black and white. The north pole daisy has 5 petals. In both models, you can play with different daisy color scenarios. Even a single daisy color (black or white) can control the planet temperature for a while.